Sisi Rondina with a kill against the Lady Realtors. DEFENDING champion Petron dominated Sta. 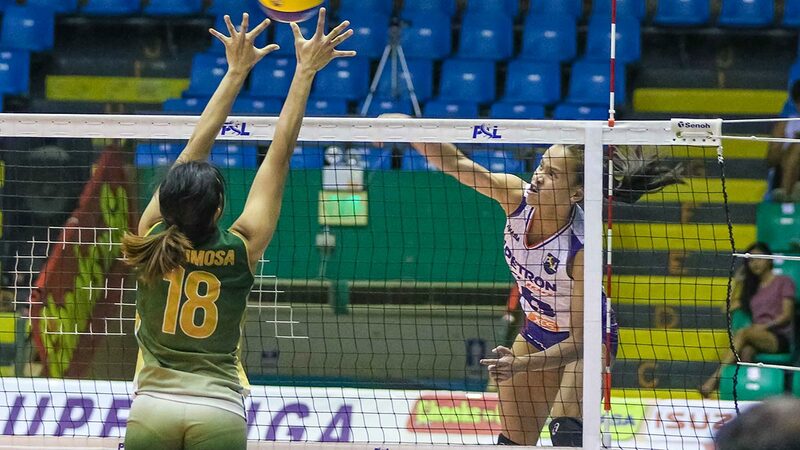 Lucia in straight sets, 25-12, 25-14, 25-16, to barge into the semifinals in the Philippine Superliga All-Filipino Conference quarterfinals on Thursday at the Batangas City Sports Coliseum. It only took 65 minutes for the Blaze Spikers, led by Ces Molina, Remy Palma and Aiza Maizo-Pontillas, to eliminate the hapless Lady Realtors. Team captain Molina led the charge with 15 points highlighted by seven blocks and had a great floor defense with 10 digs and six excellent receptions. Palma and Pontillas chipped in 13 and 11 hits, respectively. Rhea Dimaculangan scattered the offensive loads with 23 excellent sets on top of five points, while libero Buding Duremdes had 14 digs and five receptions. Petron will battle the winner of Foton and Cignal, who will clash in a knockout semifinals on Saturday at the Arena in San Juan City. The do-or-die semis games fire off next week at the Muntinlupa Sports Center. The Blaze Spikers annihilated the Lady Realtors in all departments with a 42-20 disparity in spiking, 10-0 differential in service aces and 11-4 edge in blocking. Souzan Raslan was the lone double digits scorer of the Lady Realtors with 10 points as Sta. Lucia finished the conference without a single win in 11 games.